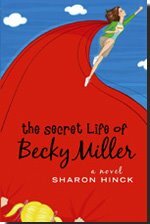 Sharon's new mom-lit novel is THE SECRET LIFE OF BECKY MILLER! Faster than a speeding minivan, able to leap piles of laundry in a single bound. It’s a bird, it’s a plane. It’s Supermom! Move over, Walter Mitty. Here comes Becky Miller. A young mother with grandiose daydreams and a longing to do “Big Things for God” searches for direction amid the chaos of daily life and the disappointment of failed opportunities. And now, Camy puts Sharon on the hotseat! Hi Sharon. You look remarkably well considering you were just strangled with your heroine Becky's red cape at Mount Hermon conference in April. Come to think of it, I look pretty good after rising from my wasabi-poisoned death. You'd probably be interested to know that you were chosen as Mildred/Brandilyn's fourth victim because I mentioned your name, which was after you'd gone to bed. What are your thoughts on the afterlife? Pshaw. Surely you didn’t think I’d let some serial killer end my writing career that easily, did you? I feigned death as a ruse...using the Tibetan techniques I learned during one of my missions to Nepal during my C.I.A. days. (Ooops, I’m not supposed to talk about that—top secret and all). 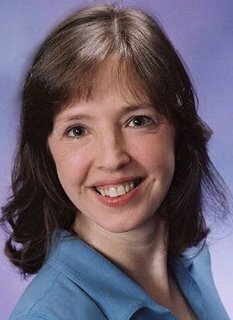 What inspired THE SECRET LIFE OF BECKY MILLER? Did you have to go undercover and spy on overachieving Christian mothers in their natural environment? Absolutely. I infiltrated home Bible study groups, church Mom’s groups, and even individual homes and recorded my observations and then analyzed the data. Apparently, Christian women feel a huge responsibility to do everything, do it well, AND save the world while they’re at it. They get rather cranky when they don’t measure up to their own expectations. I was glad for my Kevlar vest. Exhausted and overwhelmed Supermoms are scary! You once had a Christian dance company. 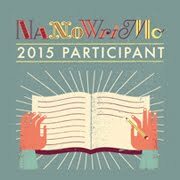 Do you think any of your dance experience will make it into a novel? And if so, will you name your character Camy if, oh, say, a dozen pounds of chocolate showed up at your door? Hey, twinkle-toes. Everyone knows you’re graceful. 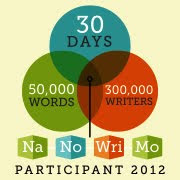 If I had a ballerina named Camy, readers would think I was writing nonfiction and I’m determined to stick with fiction. BUT the chocolates are still a good idea. Ak! I hate that question, because it’s like trying to decide who to invite to a wedding. You don’t want to forget anyone, and the list gets longer and longer and longer. I read lots of ABA fiction (Jasper Fforde, Jeanne Ray, Mark Dunn, Diana Gabaldon, Sharyn McCrumb, Leif Enger, Sue Monk Kidd, Jill Churchill, L.M. Montgomery ...everyone knows her for Anne of Green Gables, but “The Blue Castle” is an under-discovered gem...and another GREAT find is Carl Sandburg’s Rootabaga Stories) I’m all over the board. My book shelves have multiple-personality disorder. Classics, Sci-fi, fantasy, chick-lit, mystery, women’s fiction, suspense, literary. an adventure full of exciting battles, dangerous journeys, dead-ends, overwhelming obstacles, precious comrades, and a glorious quest. II Corinthians 4:7... “We have this treasure in jars of clay to show that this all-surpassing power is from God and not from us.” I’m a cracked, dented, leaky clay pot. I want to be glorious, beautiful, flawless. I’m not. And God is showing me all the time that the places where I’m broken are where His grace leaks out...Those are the places I can be a blessing. In my weakness and honesty. What is your favorite ethnic food, and what special dish will you cook for me when I come visit you someday soon? You’ve GOTTA try my Granny’s Russian meatballs with sour cream gravy. And her meatball and potato soup that is served with pickles and sour cream (it’s the BEST). If you were a zoo animal, what would you be and why? Camy, are you having delusions of being Barbara Walters, here? Next you’ll ask me what kind of tree I’d be. If I were a zoo animal, I’d be an ESCAPING zoo animal. Do you have any favorite TV shows BESIDES Gilmore Girls? Okay, this is a dangerous question. I SO want to claim I only watch nature documentaries and religious programs at odd hours. But I guess I’ll be honest. I ADORE House. (I know, I know. Lots of inappropriate content...but SUCH terrific character study...and some surprisingly heartfelt discussions on issues of faith). Law and Order (crime dramas are fun...but also there is some strong well-balanced writing around ethical questions and again, matters of faith are often addresses from more than just a “Christians are stupid” angle.). 24 (totally my husband’s fault for getting me hooked). Lost (totally my daughter’s fault). Prison Break (totally my son’s fault). Extreme Makeover Home Edition is a joyous experience to watch. I catch some of the other reality shows when I can. I first watched Survivor because I’ve always loved books about being stranded on an island...but it turned out to be less about surviving elements and more about interacting with others, and sometimes the interactions get so nasty, it’s not fun to watch. My husband and I enjoy Amazing Race, and one year for our anniversary I set up an “Amazing Race” trip for the two of us complete with envelopes and detours and a pit stop. I MUST tell everyone what a super encourager and honest critique-buddy you’ve been over the years. Of course I’ll never be HALF as hip as you are, but I’ve been so blessed by our friendship and it’s strengthened my life as a writer. Also, everyone is invited to pop over to my website. 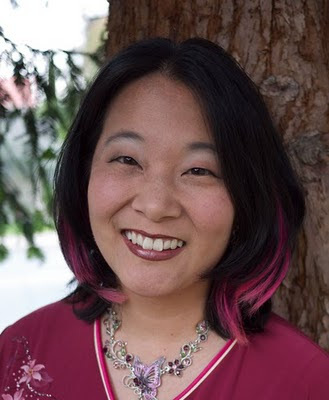 I have a fun “Cosmo-style” quiz to help you find out which of Becky Miller’s friends you are most like, and lots of other fun stuff to explore. www.sharonhinck.com. Thanks for inviting me to your awesome blog! Camy here: Aw, thanks, Sharon!